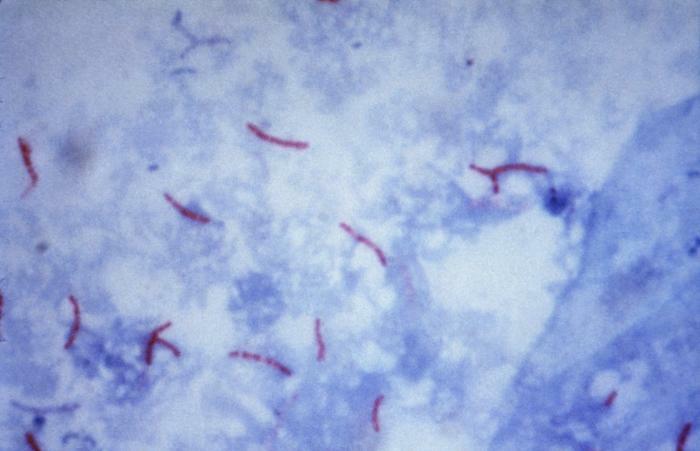 English: This photomicrograph reveals Mycobacterium tuberculosis bacteria using acid-fast Ziehl-Neelsen stain; Magnified 1000 X. The acid-fast stains depend on the ability of mycobacteria to retain dye when treated with mineral acid or an acid-alcohol solution such as the Ziehl-Neelsen, or the Kinyoun stains that are carbolfuchsin methods specific for M. tuberculosis. public domain - "Copyright Restrictions: None - This image is in the public domain and thus free of any copyright restrictions. As a matter of courtesy we request that the content provider be credited and notified in any public or private usage of this image." This image is a work of the Centers for Disease Control and Prevention, part of the United States Department of Health and Human Services, taken or made during the course of an employee's official duties. As a work of the U.S. federal government, the image is in the public domain. ?esky | Deutsch | English | Español | Eesti | Suomi | Français | Italiano | ?????????? | Nederlands | Polski | Português | ?? | ???(??)? | +/?